Israeli superstars Rami Kleinstein and Amir Benayoun perform. A mega event marking the 50th anniversary of the liberation of Hebron was held at the foot of the Tomb of Machpela on Thursday. A special light display projected images on the 2,000-year-old walls of the Tomb of Machpela complex including a giant Israeli flags, geometric images and scenes of Hebron's history. Introductory speakers included community leader Rabbi Hillel Horowitz, spokesperson Noam Arnon, director of the municipality Uri Karzen, Mayor Avraham Ben Yosef, head of the Nir Yeshiva Rabbi Eliezer Waldman and Member of Knesset David Azoulay (Shas). A video greeting from various elected officials was shown which included words of support from Speaker of the Knesset Yuli Edelstein, MK Ayoub Kara (Likud), MK Sharren Haskel (Likud), MK Amir Ohana (Likud), MK Oded Forer (Yisrael Beitenu), MK Nava Boker (Likud), MK Oren Hazan (Likud), MK Mordechai Yogev (Bayit Yehudi), MK Betzalel Smotrich (Bayit Yehudi), and more. 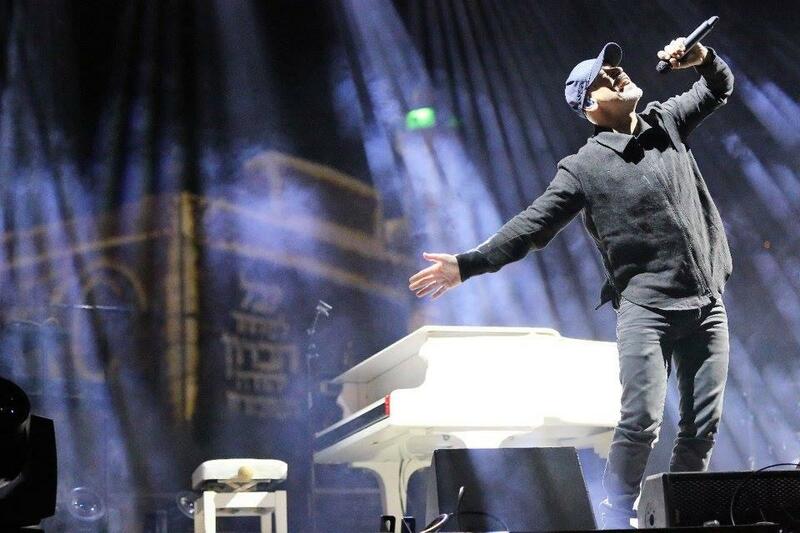 After that, the central event began with Rami Kleinstein, a multi-platinum selling singer-songwriter who won a Singer of the Year award and was a judge on Israeli TV's The Voice. Kleinstein had been pressured by Peace Now not to perform in Hebron because it is part of the land of Judea liberated from Jordan during the Six Day War of 1967 which they would like to see relinquished in the name of peace. "I was pressured not to perform here but we must remember that music aims to connect between one another and bridge differences of opinion. My goal is to create music that reaches every person, regardless of the color of his skin or his political opinions. It is very sad that the word boycott should be associated with culture and music, there is no room for it and I certainly will not lend a hand to it. I hope that one day we will understand the phrase love your neighbor as yourself." Kleinstein sang and played piano as he performed his pop and rock hits as well as traditional Biblical Psalms. He dedicated one song to his now pregnant wife .This was Kleinstein's first performance in Hebron although he played in the sister city of Kiryat Arba in 2014. Also performing was Amir Benayoun, an AKUM award winning composer, singer and guitarist with a dozen albums who last brought his Sephardic style and Mediterranean vibes to Hebron in 2013. The celebrants were congratulated by Education Minister Naftali Bennett (Bayit Yehudi), who reviewed the history of Hebron throughout the generations from the time of Abraham who bought the Cave of Machpela from Efron the Hittite, through Caleb ben Yefune who scouted out the land, King David who made the city his first capital, until the liberation of Hebron in the Six Day War. At the end of the speech, the minister made a special note of thanks to the families who renewed the Jewish neighborhoods, especially the late Rabbi Moshe Levinger. "Who would have believed that thanks to Rabbi Levinger and those families we will see the masses here today," he stated. 'From here the power will come to the leaders of Israel. We will stand strong and remember that our Land of Israel is ours. Deputy Defense Minister Eli Ben Dahan (Bayit Yehudi) announced that the excavations in Tel Rumeida /Tel Hevron are nearing completion. "I am happy to announce that you will soon be able to come here to Hebron, the City of the Patriarchs, and see where our roots were planted as a people," he said. "In the past year, together with the heads of the Jewish community of Hebron, we have accelerated the process of cleaning up the site, completing the excavations, and in a few weeks you will be able to visit archaeological sites that illustrates the extensive Jewish history in this city." "The people of Israel returned home to the forefathers and mothers of the nation, and I would like to thank the pioneers of the settlement of the land. We pledge to continue to build, build and build."